Jewellery from Ghana, Kenya, Mali and Tansania. From traditional to modern. With and without typical symbols such as "Gye Nyame" or "Sankofa". 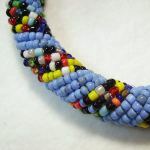 Old and new trade beads. 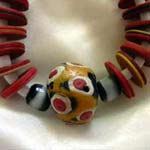 All jewellry items are handmade, are therefore unique and can vary slightly in size, appearance, colour and shape. Massai, leather, horn, coconut .... all kinds of everything to be found here! From old antique to very modern ethnic - Spoil yourself with a unique piece of neckware. 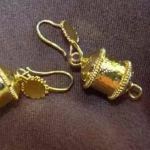 Earrings from Ghana, Kenya and Tansania - metal and gold. Please see earrings nature for horn and bone earrings.